The Kepler track is one of New Zealand’s “great walks,” with impeccably maintained trails through classic NZ scenery and large plush hut accommodations. It’s a 4-day hike near the Fjordlands that starts out in lowland Beech forest, climbs to tussock-grasslands with sweeping views, then dips back down into the forest greenery. We chose this one in particular because it ends where it starts–no extra transportation necessary. Here we are, packs laden with supplies and ready to enjoy our tramp. I absolutely loved the green mossy beech forest, studded with ferns. It’s what I imagine the Elves inhabit in Tolkien’s worlds. I think I love it so much because the greenery above and below feels like home. I’ve heard Kiwis speak about the open tussock lands with the same affection I feel for the green forest, because it’s their home I suppose, like Oklahoma is home to some Americans. But I certainly don’t identify with that barren exposed wind-swept brownness. To me, comfort is the green deciduous forest. The catch is that I don’t think beech trees are deciduous here! It was 9-10 miles to the first hut, and my feet were glad to get there! Big, posh (for a DOC hut), with gas cookers, running water, and mattresses on the bunks, these accommodations were handsome. Giggle! Two happy faces, playing on the beach. Milo spent a good long time the first evening arranging the lake-side drift wood in the sand. Pizza was the creation of the evening, probably because we had just cooked and eaten some nice pizzas for dinner. I find watching him quite interesting, he’s getting very dextrous with his fingers. Aw, what a happy portrait! Milo always starts out the day walking, and one way we try and motivate him to continue making forward progress (past all the fascinating sticks and rocks that could be picked up and thrown) is to play hide and seek. This morning I was running ahead and hiking behind various trees and rocks, calling Milo to find me. “I want to do it myself!” Yes, we’re in that phase. Mama crossed without Daddy carrying her, so Milo wants to walk the log too. Preferentially without holding Daddy’s hand, but he did compromise on that point. 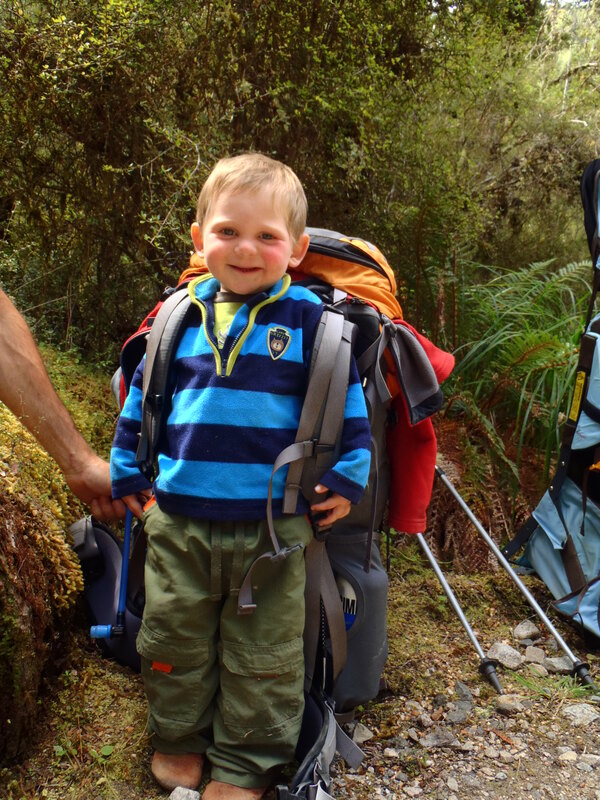 We did suggest that if he wants to do things himself, he might like to carry Daddy’s BIG backpack….but after the photo shoot, he decided that he’ best leave that task to Dad. Almost at the second night hut, but and M&M break and map check was necessary. As parents concerned with our son’s health, we tried having Milo eat 5 raisins for every one M&M, which does work (the nuts in the GORP get rejected out of hand). But the side effect that evening was the world’s messiest diaper, so we gave that up, opting for a constipated chocolate-stuffed child to a sloppy-poop one, at least while tramping,. Another trail diversion, insects! We managed to snap a photo of this cicada before Milo thoughtfully shooed it off my shoulder. Running to catch up to Mama and Daddy is another favorite trail activity for Milo. He’ll actually pause, motion us ahead, then run to catch up. Perfect trail for that, almost handicap accessible, with no tricksy roots or rocks. Peekaboo! This hollow tree was still very much alive. I started to explain to Milo that trees are only alive on their outsides, but the detail was lost on him still. We were glad for the screened windows on this hut, set in a meadow with thousands of “sandflies” (a type of biting black fly). Most people were hiking the track in the opposite direction as we were and had just come down a big hill to arrive at the hut. They looked at us carrying Milo, raised their eyebrows, shuffled their sore feet, and warned us of the steepness…..We would have been more concerned if they had all been young and fit, but since they were mostly in their 40s, 50s and beyond, we kept our rude thoughts to ourselves and managed the next day’s climb without incident. Getting old must stink….hopefully it’ll be so gradual that it isn’t a shock. Milo loves wielding the camera, and sometimes his perspectives are interesting. I forget what it’s like to see everything from knee height. The Aussie guy in this photo was super kind and carried out Milo’s dirty diapers for us, since he was going the opposite direction and was only one day from the end of his hike. Phew, quite a generous offer! We figured the climb was almost over once we popped out of the forest into the tussock tops (it happens in about 2 steps, no gradual transition but I haven’t yet figured out why). Actually, that cool ridge track was so steep in places that it was punctuated with over 200 steps. We lunched at a shelter at the top of the ridgeline. It must be about the mid-way mark on the trail because it was the lunch spot of choice for folks headed the other direction too (the majority of the crowd). It’s fun to chat with them all, see their outfits, hear their accents, and exchange pleasantries. The young fit Germans arrived first, followed later by the older folks. We see “heaps” (as the Kiwis say) of Germans on the trails. They’re all cheerful, young and spry, with good gear. Completely not my stereotype of a stodgy sausage-toting “Herr Schneider.” That’s good, breaking stereotypes is a positive side-effect of travel. And the formation of new stereotypes is fun too, as long as we don’t take them too seriously. Milo demanded some time out of the backpack (WAK!) so he trucked along for a few minutes after lunch, completely oblivious to the views but happy to be walking himself. He may be oblivious to the views, but he still gives the thumbs up on cue! We had super fine weather for the ridgeline part of the Kepler track. It can get windy, rainy, and downright nasty at times, but we strolled along with unhindered views and a light breeze. The tiny alpine flowers and berries are a reminder of how harsh the weather can be up here–hunkered down low to the ground to let the worst of the wind pass them over. Once upon a time this lake was a glacier, and somehow this outcrop survived the pummeling to stand as a magnificent viewing spot for generations to come. Luxmore hut, set up on the tussock tops, was probably the most luxurious of the trek accommodations. It sleeps 54 trampers, and has big windows that afford panoramic views of the lake below. Milo certainly enjoyed it, and set about charming everyone he rubbed elbows with. Here’s Milo, staking out his spot on the bunk. “Me, me, me!” he says as he pats his chest. Yes Milo, that’s your corner for sleeping. There are caves near the hut, this one specially marked out for hikers to take a casual look. Milo was pretty nervous going down there, which surprised me. When did he learn to be afraid of a dark damp place? Water dripping through the rock left white limestone deposits, and a few ornate stalactites. Thinking back on it now, I can’t remember why there were some years in my life when I found caves fascinating. Since then I’ve most definitely become a creature of the light, and the lure of strange formations and white creatures of the caves is completely gone. This is such a Kiwi attitude. They believe anything non-native is bad. I guess I don’t love stoats, they’re the bad guys in Wind in the Willows after all. But face to face, they’re cute little ferrety buggers, and if they eat native bird eggs, it’s only what they do to survive…..same as people clear land and plant crops. Native birds are naive enough to make nests on the ground, which is only what they do because they didn’t evolve with predators, and haven’t learned any better. But now people are going to great effort to reverse the evolutionary trend and keep the kiwi and other native birds alive by massive predator trapping and poisoning programs. Seems like an uphill battle to me, but New Zealanders believe it’s worth fighting. First spot of rain during the night and early morning, but it made for an interesting sunrise. We’re suited up and ready to go, keeping the little guy warm and dry. This hut even has a helicopter landing pad! “Hut” seems like a misnomer. It’s more appropriately termed a back country lodge. Though unlike the back country huts in Argentina, you can’t purchase a bottle of wine and dinner up here. A few hours down through beech forest and we reached the lake where we ate lunch. The sandflies were so thick that we tucked our pants into our socks and didn’t linger over the meal. There’s a campground down there, but I’m glad we didn’t tent there! Finished with hiking the Kepler track, and we’re all still smiling! It was a magnificent hike. WOW!!! Thanks for sharing a record of the trip with us. I am always amazed by your adventures. Do you guys keep track of miles you go each time? We don’t really keep track of the distances, because the trails aren’t marked with kilometers (or miles). The signs just give an approximate number of hours between points, which we think is a bit odd since it’s subjective and they don’t follow a consistent formula that takes distance and elevation into account….but that’s the way they do it here.